In Making Peace With Your Team Leader, I wrote about the difficulty of resolving conflicts when there is a power differential between the parties, particularly when you have an issue with your manager. I talked about what to do and what not to do. One of the “to do’s” was to ask questions nicely. I just read a book that has a chapter devoted to this very topic, so here’s a short post to share its ideas. The book is When to Speak Up and When to Shut Up: Principles for Conversations You Won’t Regret by Michael Sedler. It’s got a great title because who hasn’t had a time when they wish they’d had the courage to speak up, or that they’d had the wisdom to say nothing? We’ve all had those experiences. Most of the book, though, is about the wisdom of silence and listening. However, when in conflict with a person in authority, Sedler says we first have to check our motives. If we want to create disunity, override someone’s opinion with our own, or prove our point, our motives are wrong and we should not speak up. Improper motivations are evident when someone just doesn’t accept an answer and persists in asking more questions. Complaining and challenging are two other indicators as are debating or disputing, making accusations and taking offense. These are all manifestations of a questioning attitude. The questions aren’t really the issue, there is a deeper problem with the person’s attitude towards those in authority. A healthier way is to ask questions. It’s a pretty fine distinction, but Sedler means the right way is asking questions with a sincere desire to understand rather than asking questions to confront. Nicodemus asking Jesus about how a man can be born again is a prime example of someone truly engaged in productive questioning. Prepare yourself by asking God to give you words so you’ll be understood. If you are overly emotional or frustrated, get some godly counsel as well. Book an appointment and ask for the amount of time you think it should take. When everyone has time for the conversation, it will go much better. People can focus on the issue at hand and they don’t have to cut out in the middle to get to another appointment. Get to the point quickly. Don’t leave the person wondering where the conversation is going. Let the person know you recognize their authority. You are asking for clarification or background information. Don’t be inflammatory, just ask your questions simply and state your concern. If you don’t understand the answer or see how it relates to your concerns, ask the person to go over it again or express it in a different way. Don’t become defensive. Just explain your concern. Don’t try to justify yourself or your position. One or two pieces of evidence as to why you see the issue differently are sufficient for the other person to understand you. Thank the person for their time and ask if you can connect again if other questions arise. But don’t come back with the same questions. Sedler nails how conversations really go. It’s intensely practical and written with great humility, using his own experiences as examples of what not to do. If you’ve had conversations that haven’t gone well and you’re not sure why, he explains it. He has practical tips for how to handle different types of difficult conversations well. It is very positive, easy to read and well written. The author is a Jew who was brought up really Jewish. His testimony of how he became a Christian is told in an appendix and it is very interesting. I am glad that you brought this up – because I also just read your blog post about Movember. I think it’s great you are able to support your son as he grows a mustache for the month and participates in fundraising for this very worthy cause. But I have a bone to pick with you. You said that you can’t grow a mustache because – your wife won’t let you? Are you sure? Have you asked – or are you just making that assumption on her behalf? 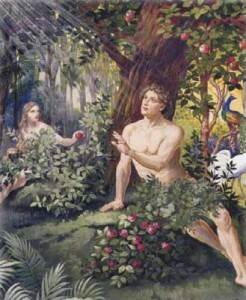 See section above about Adam and Eve. Ok – I know what you will say (I did for a long time) “Hey, it’s no biggy – Ok? And anyways it shows how much I respect my wife – and I think that follows the Bible scripture. It’s just my vanity I’m sacrificing.” Really – where does it say that small dedications FOR THE BETTERMENT of your fellow men are not allowed? What it really indicates is a blind spot in your relationship with your wife . 1) if this is REALLY a problem for her – well I suggest you do some serious marriage counselling. For 1 month she would not allow her husband to make such a small gesture about his personal appearance? No I doubt that is the reason. 2) Vanity or Pride? And I am not talking about the vanity of your moustache. I am talking about your relationship with your wife. To make some meaningless concession on a pretty inconsequential issue for a short time indicates a troubling attitude. It sort of screams “appearances are more important that substance”. Kinda shallow – don’t ya think? Then there is the aspect of how Evangelical Christians have kinda gone overboard on this “the wife is charge of that little stuff, and I am in caharge of the REALLY BIG stuff” idea. Or perhaps it is part of the “submit to your husband” tradeoff gone astray. I mean I am all in favour of areas of personal responsibility – but I feel things have been getting out of hand since the feminists took over – and while it took a while to reach the church – even they have not been able to deal with the onslaught of popular opinion. Part and parcel of this is the overwhelming appeasement of men to their wives one many issues where in teh past they may have had more influence sway – childcare, sexuality, etc. That is (to use another phrase I see here) “Proper Accountability” – to yourself, your wife, your family – but perhaps most important – to the brotherhood of men. They have been getting very short shrift over the last decade – and we all need to honour that part of our society more. Thank you Chris. You and I agree that men’s health is a very important issue. Even though it is not the topic of this blog, I augmented my financial support for the cause by bringing Movember to the attention of my readers with a light-hearted post (at /news_blogs/john/2012/11/08/my-virtual-participation-in-movember/ for those who haven’t seen it).